Attract bees to your rain garden and help to propogate your own plants. Attract bees to your native rain garden to help propogate and maintain your wildflowers. However, be wary. As you all know bees can sting so watch your children. The common rule of thumb is to watch without touching and they will leave you alone as they buzz about their own business. Be sure and keep your children away from their nests as well. Honey bees are probably the worlds greatest pollinators. But the orchard bee runs a close second The orcahrd be is blue black in color, looking a little like a fly. Be cautious of afracinized honeybees, but not so terrified that you arbitraily kill any be that looks a little like them. Africanized honey bees have only caused 11 deaths and these in people with severe allergy. As with any other bee, leave their nest alone and they will leave you alone. The only way to tell them apart from true honey bees is by their behavior. By taking these simple precautions having bees around can be very rewarding. Bees are nature's ultimate pollinator and, if you choose to become a beekeeper, can provide you with endless gobs of golden honey. If you're not a beekeeper, it can still be a delight to watch those fat bodied bumble bees and their slimmer cousins buzz about your rain gardens, sucking up nectar, while getting their fuzzy little bodies covered in pollen to be carried to the next flower. Bees are essential to the propogation and health of a host of various flowers and plants, including orchard trees. 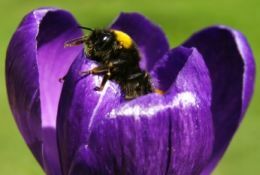 Unfortunately widsespread pesticide use and pests like mites, have devastated wild honey bee and domestic bee populations, which in turn has a major affect on the native plant species that depend on them for pollination. Bee Home to your garden if you'ld like your flowers to propogate and leave future generations or if you'ld like to grow your garden larger without buying more plants. Your native wildflowers will readily attract bees, but if you'ld like to focus your effort, attract bees with yellow. They can not see red. If you're interested in attracting orchard or honeybees to your home there are nest boxes that you can build to encourage them to stay out in the yard rather than in your house. There is also a wonderful website and program that you can use to learn more at backyardhive.com. With this hive program you can actually keep your own bees and harvest your own honeycomb. If your not interested in this much work, you can still lend a hand by putting out a nesting box for orchard bees which can not drill to make their own homes. They use pre-existing holes. If you prefer fat bodied bumble bees, try making a bumble bee house .